8.30 hours: check out. Today we will leave Tbilisi to leave for Armenia by bus and pass the border at Sadakhlo. At the border we need to take all our luggage from the bus, pass on foot and have our luggage inspected. Then we will change to an Armenian bus and you will be able to change (a small sum of) money. Today´s destination is Sevan Lake, a big sweet water lake at an altitude of around 2000 meters surrounded by mountains. Reaching the lake there will be time to have lunch. It will be included because travelling with a group will make it necessary to preorder. Near the restaurant you can hike 200 steps up to reach the top of Aghtamar peninsula which offers a beautiful view on the mountains surrounding the lake. 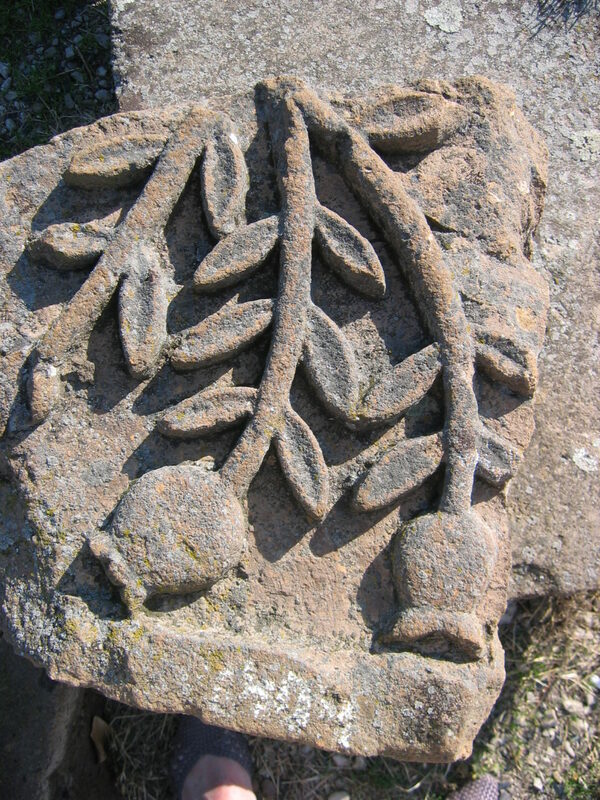 On top of the peninsula there are two small churches and decorated cross stones. We will continue to Yerevan and check in at our hotel. If you fly directly from your home country and did not participate in the Georgia tour: your room will be available from 12.00 hrs. A transfer of about 20 minutes to IBIS hotel in the center of Yerevan will be included. Tonight we will meet with the whole group and have dinner (included) in the city. City walk to get acquainted with Yerevan. No lunch provided, but our hotel has a rooftop restaurant. There is also an abundance of restaurants in the near vicinity of our hotel or a local supermarket which sells fresh lunch snacks and salads. In the afternoon we will have a dance class (2 ½ hrs.). Local teacher Gagik Kinosyan will teach us some traditional Armenian dances. Dance class (2 ½ hrs.) in the morning and free afternoon to explore Yerevan. If you don't want to go shopping, the Matenadaran Museum can be an interesting place to visit. It hosts the world’s largest collection of Armenian manuscripts. Likewise worth a visit are the Historical Museum, the Museum of Russian painters or the Cascade - a giant stairway made of limestone adorned with fountains and modernist sculptures and surrounded with cozy restaurants. A short drive by taxi can take you to the Genocide monument or to Erebuni. Erebuni is the foundation of a fortress and the founding of the city of Yerevan (782 BC). It has a small but very interesting museum with English explanation of the artefacts. Simply enjoying a drink on one of the many terraces in the green ring of parkland which crosses Yerevan is also very relaxing. Dance class (2 ½ hrs.) in the morning. In the afternoon we will travel to Talin to meet with a dance group from Sasnashen. 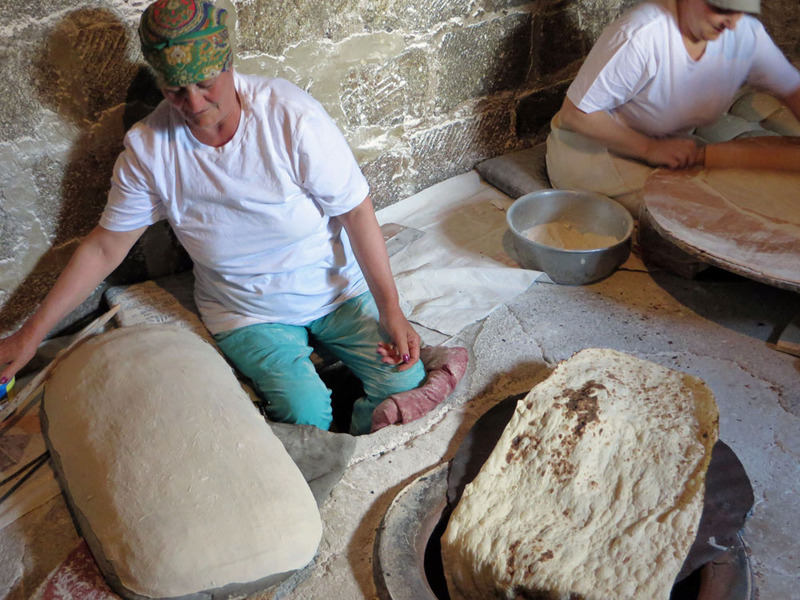 In a small bakery you can see how lavash, the traditional bread, is baked according to old traditions. Many immigrants from the former West Armenian region of Sasoun (nowadays in Turkish Anatolia) settled around the city of Talin after the genocide. The local dance group has managed to keep its dance heritage alive for almost a century. This visit will not only offer us the chance to dance in the company of the villagers, but also to get familiar with Armenian toasting habits. 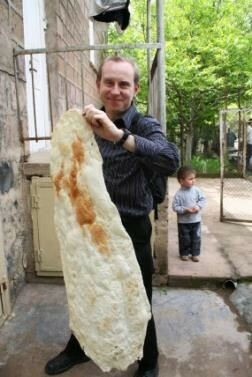 Besides freshly baked lavash we will undoubtedly enjoy other locally made products as well as a delicious kebab dinner. Make sure to watch the impressive sound and light show which starts around 21.00 hrs. at Yerevan’s central square, located very close to our hotel. The place to hang out for the inhabitants of Yerevan. If tonight is not your night: the show is performed every night. 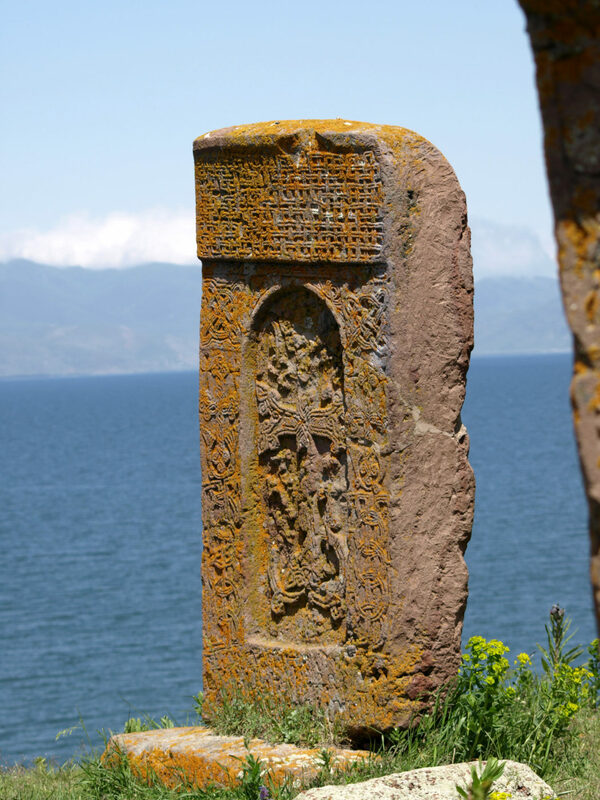 Check out to start our 4-day tour to the eastern part of Armenia. We will have a first stop in Khor Virap. 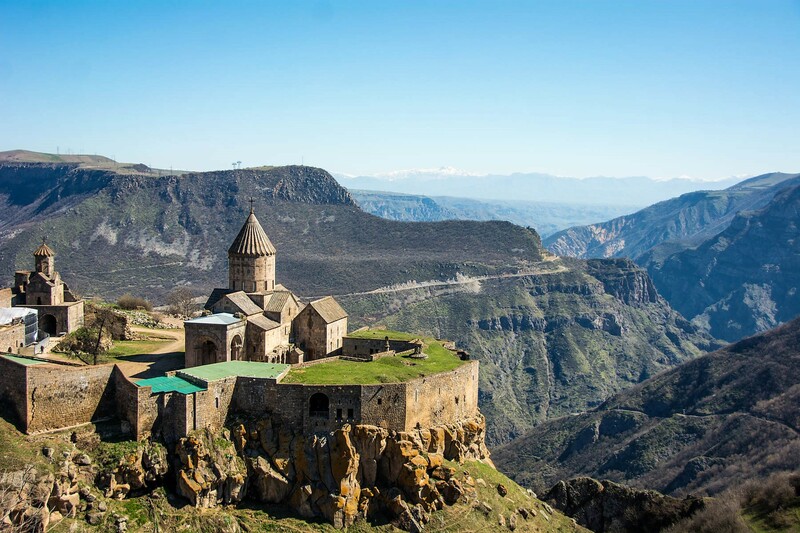 The church is located on the Turkish-Armenian border and very close to Mount Ararat, which is considered a national symbol for the Armenians because the ark of Noah would have been stranded here. From Khor Virap there is a beautiful view of the mountain if clouds don’t cover its 5137 meters high peak. The monastery is known because Gregorius the Illuminator was imprisoned by King Tiridates IV for thirteen years. After Gregory converted the king to Christianity in 301, Armenia became the first country to accept Christianity as a state religion. On our way we pass fish ponds and fruit orchards in the Ararat Valley, the only flat region in Armenia. The landscape is becoming more mountainous and rugged before reaching our picturesque open air restaurant to have lunch (included) past the wine village of Areni. 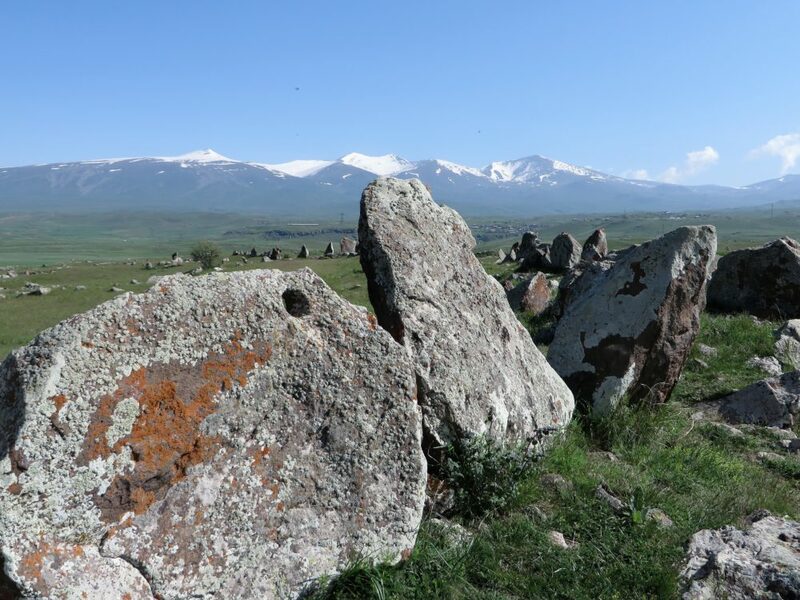 Our next stop will be Karahountj, also called Zorats karer, a circular arrangement of 204 stones with holes in them, which is similar to England's Stonehenge, but older. It is surrounded by an impressive landscape and in this time of year many flowers will bloom. After another 75 minutes we will reach our final destination for today, the small town of Goris, where we will spend the next two nights. Today we have an early departure (8.15 hrs.) to allow us to see two interesting sights in this part of the country in a full day tour. 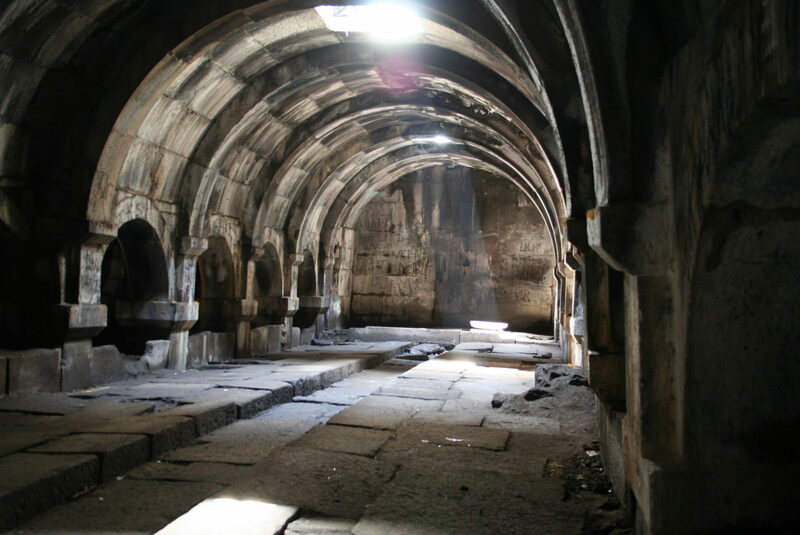 Slightly beyond the city of Goris the caves of ancient Khundzoresk are situated. An extensive walk through this bizarre-looking landscape of rocky points with caves really gives a good impression of the vastness. In the late 19th century up to 4000 people lived here. There will be time to buy yourself a lunch in the local supermarket before we will leave for a hiking experience in Khundzoresk. Back to our hotel in Goris. Check out at 8.30 hrs. Today’s tour leads us back in the direction of Yerevan. 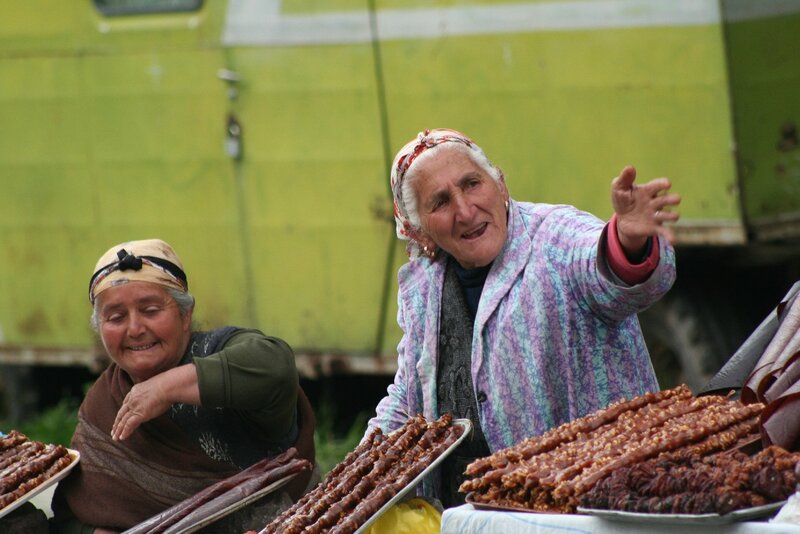 On our way we will reach an elevation of 2344 metres on the Volotan Pass, where some merchants sell their produce. We are travelling in the footsteps of the ancient Silk Road. After about 2 1/2 hrs. we will have a stop for a coffee break at Parvani restaurant along Arpa river. For those who want to make an easy hike, the bus will be ready to drive a short distance along the old road that used to connect Jermuk with the main road. Nature is very scenic here and basalt stone formations form an impressive scenery. 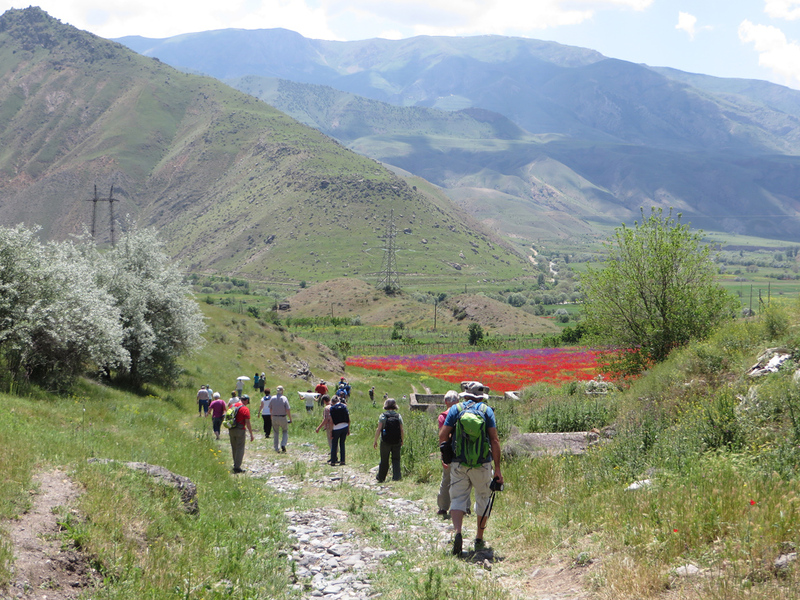 We will be dropped off after about 3 kilometres and can walk back to our starting point to enjoy the landscape on foot. If you have developed an appetite that is just fine because a delicious lunch (incl.) is waiting for us at Parvani restaurant. After lunch we will continue our tour to turn off the main road northward to reach our final destination for today, Hotel Resort Lucy Tour, where we will stay one night at cottages in the mountains in the village of Hermon. It has an open-air restaurant and bar, playgrounds, indoor swimming pool, ping-pong tables and billiards. We will have our dinner here and meet with a local dance group for an evening dance party. Free morning. If you enjoy hiking: there is a beautiful fortress which can be reached after about 2-3 hours hiking. A shorter private hike in the surrounding mountains is another option or just simply relax. We can arrange for a guide to organize an early hike to the fortress and have lunch (incl.) together. After lunch we will return to Yerevan and make a stop at Noravank Monastery where we will have a guided tour. It is located at the end of a gorge with stunning views on the surrounding mountains. 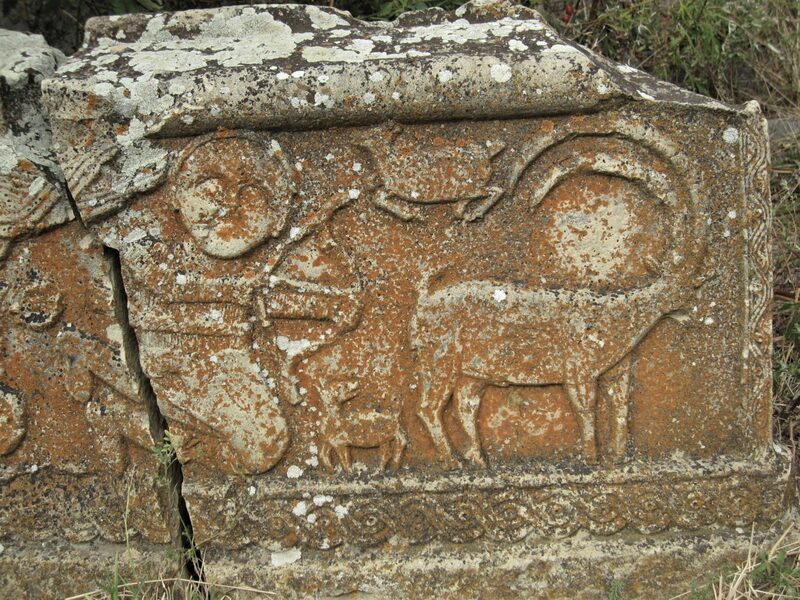 It is a real gem among the great number of ancient monuments in Armenia. We will continue our way to Yerevan and will stay again at IBIS hotel. Free night, no dinner provided. Free day to do your last shopping or sightseeing. 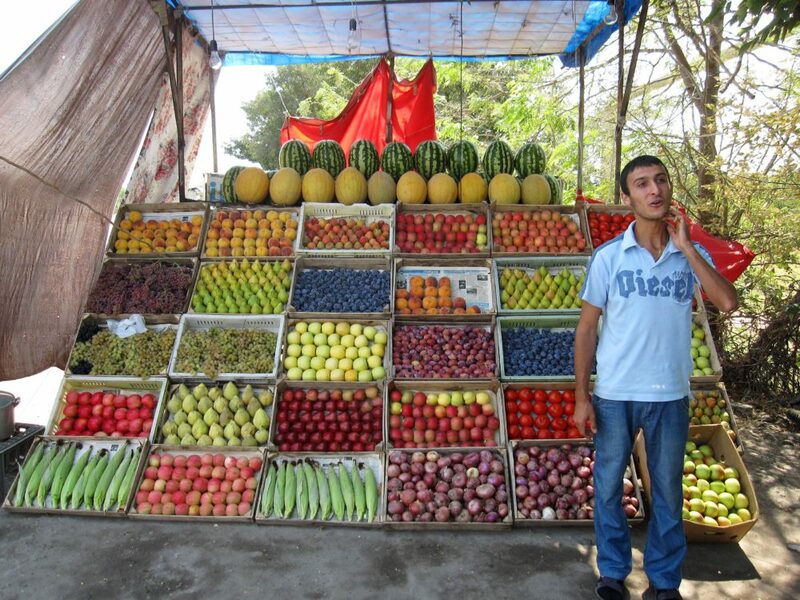 This offers you an opportunity to visit the Vernisage, a daily market in Yerevan. Craftsmen sell their products and it is a good place to buy souvenirs. In the Bazaar you can find vegetables, fruit and cheese. 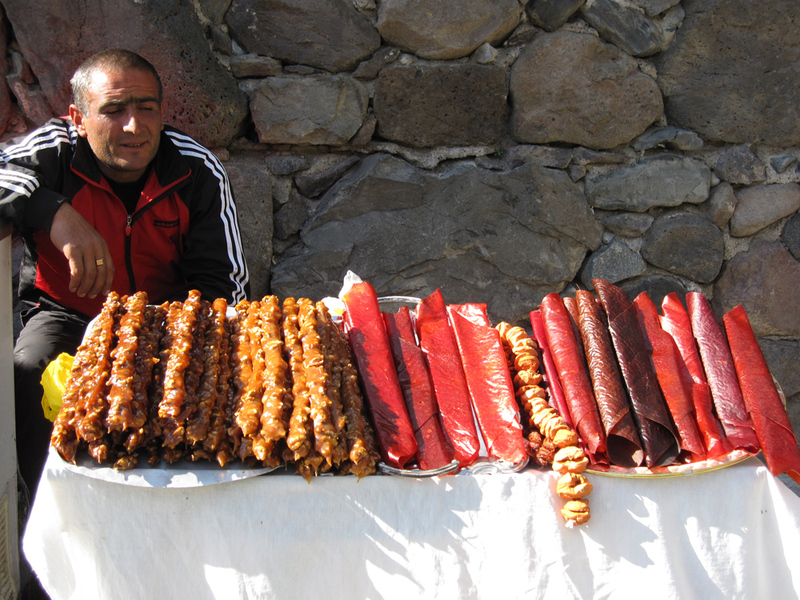 Armenia is famous for its dried fruits filled with nuts and tasting is never a problem! Departure incl. transfer to the airport. The minimum required number of participants is 15 persons.